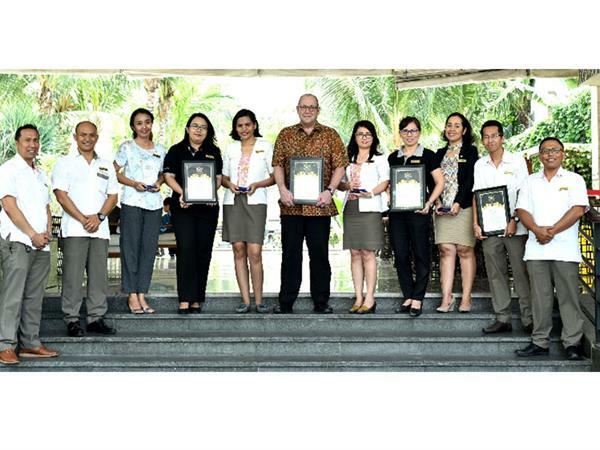 Swiss-Belresort Watu Jimbar was named Bali Leading 4-Star Non-Beach Resort and Swiss-Belhotel Tuban received the awards for Bali’s Leading Airport Hotel. In addition, an individual award was given to Christopher MacLean who was named Bali Top Hospitality Leader and Swiss-Belhotel International also received the Bali Leading Regional Operator Award in recognition of the brand’s continued success. In 2016, Swiss-Belresort Watu Jimbar scooped Bali’s Leading New Resort award, while Swiss-Belhotel Tuban was named Bali’s Leading 4-Star Hotel at the Bali Tourism Awards, which made this year’s awards a double-win for both properties. The Bali Tourism Awards are considered highly prestigious industry accolades as they recognise travel, tourism and hospitality companies, organisations and individuals who are raising the bar in terms of quality of facilities, services and guest experiences. Award nominees are voted for online, while a Board of Advisors and representatives from the BINUS Business School – a valued partner for the award founders the ITTA Foundation – make the final selections. With over 52,000 votes cast online across seven countries this year, the Bali Tourism Awards validate travel brands that stand out in terms of performance, excellence, innovation, quality and creativity. We congratulate Mr. Chris Maclean, the hotel staff at Swiss-Belresort Watu Jimbar and Swiss-Belhotel Tuban and the Bali and Indonesia regional office teams for this achievement.